President George H.W. 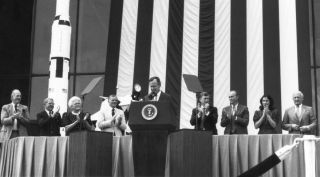 Bush speaks at the National Air and Space Museum on the 20th anniversary of Apollo 11 in July 1989, announcing his proposed Space Exploration Initiative. WASHINGTON — Despite serving just a single term in the White House, the late President George H.W. Bush is remembered as playing a key role in space policy as the country transitioned from the Cold War competition with the Soviet Union to a more cooperative relationship with Russia. Bush, who passed away Nov. 30 at the age of 94, is best remembered in space for his proposed Space Exploration Initiative (SEI), which he announced in 1989 on the 20th anniversary of the Apollo 11 landing. That speech set goals for a human return to the moon and later human missions to Mars. "President Bush's Space Exploration Initiative helped us to think big and long-term about space," NASA Administrator Jim Bridenstine said in a Dec. 1 statement. "His impassioned vision of 'a journey into tomorrow – a journey to another planet – a manned mission to Mars,' helped sustain NASA's early work on the International Space Station, and it still can be felt in our ongoing efforts to send humans farther into the solar system to live and work for extended periods." The Bush administration also led efforts to enhance cooperation with the Soviet Union and, after its collapse in 1991, Russia. That led to a 1992 joint statement between the United States and Russia on space cooperation that called for the flights of Russian cosmonauts on the space shuttle and a shuttle mission to dock with the Russian space station Mir, a cooperative effort that paved the way for a series of Shuttle-Mir missions and ultimately the International Space Station. "President George H.W. Bush was not only a passionate space enthusiast, he was a visionary who outlined the keys to the next great step in American space exploration," said Mark Albrecht, who was executive secretary of the National Space Council during the Bush administration. Bush, Albrecht said, provided "a reason to continue after the Cold War, the need to lead but to include essential international participation, and the necessary reform of the institution charged with making it happen." That included the council itself, which had been dormant for years before being revived by the Bush Administration. The council was disbanded after Bush left office in January 1993 and was not active again until President Trump signed an executive order in June 2017 formally reconstituting it. "The decisions and commitments made by President Bush are reflected today in space policy, in the growing influence of space on our lives, and in the life of our nation," said Mary Lynne Dittmar, president and chief executive of the Coalition for Deep Space Exploration, an industry group, citing the various accomplishments of the Bush administration. During his two terms as vice president under President Ronald Regan, Bush was also active on space, visiting the Kennedy Space Center and other facilities. He was warmly remembered by the families of the crew of the shuttle Challenger who died in January 1986. "In 1986, immediately following the Challenger accident, Vice President Bush was the first person to express his grief and great sorrow to our families," the families of the crew said in a statement. "Speaking for himself, the president, and the nation, he personally met with the families and gave us a note with his home phone number and a message 'call if you need us.'" "He knew the costs and risks and persisted nonetheless," Albrecht said of Bush. "Today's opportunity to return America to human spaceflight, to resume our essential exploration, to once again lead the world in space, is built on the selfless and principled stand of President George H.W. Bush. We in the space community are lucky to have had him." Bush's death will have some near-term impacts on NASA as well. Federal government offices will be closed Dec. 5 for a national day of mourning. That left little time this week for legislative activity in Congress, even as a continuing resolution (CR) funding part of the government, including NASA, was set to expire Dec. 7. Congress is expected to pass this week, and President Trump sign, a two-week extension of that CR to provide more time to finalize a spending bill for the rest of fiscal year 2019.